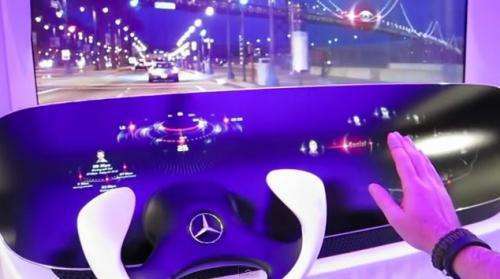 (PhysOrg.com) -- High end car maker Mercedes-Benz last week demoed new technology it’s working on for future car dashboards and windshield displays, and the result is certainly eye opening. Called the Dynamic and Intuitive Control Experience (DICE), the system is a combination of a multitude of different technologies. DICE is essentially three components, the left dash, the right dash and the windshield. The left dash is the most traditional, displaying car speed and all the other things we’re used to seeing in a dash. The right dash though is all kinds of new. It’s like an embedded iPad only its motion sensitive instead of touch sensitive. The windshield looks like an ordinary windshield but it also serves as a heads-up display. There’s not much to say about the left dash, it’s the right dash that deserves attention. In basic mode, it displays just three words, Social, Media and Places. “Social” provides a connection to the social world of the person working the system. Friends, associates, co-workers etc. They’re all there, including the means for real time interactions with them. “Media” is for controlling music or other such devices, and “Places” is for forging connections between the car and real world or places, outside. And it all works by hand gestures. Moving left to right and vice-versa highlights menu choices. To select a choice, the user pushes his or her hand forward. Also of note, it’s clear that the right dash is meant to be used by a passenger, rather than a driver, which might just be a subtle way of telling us Mercedes thinks that maybe we won’t be driving alone so much in the future. As for the windshield, in addition to providing wind relief, it is also used to display information. In some scenarios it can display augmented reality information, such as identifying builders as you pass them, or the stuff inside of them. In others it helps plot your course as you navigate through a city. Also, it can display images, such as a picture of a person associated with your “friends” menu choice on the right dash. In short, it can display pretty much anything you might find of interest. One of the most noticeable aspects of the new system is the complete absence of buttons or knobs. Many people may find this troublesome, as we humans have grown quite accustomed to adjusting things by physically moving something. But, it might just be that such knobs and whatnot are more distracting than we realize. The people at Mercedes-Benz certainly seem to think so. Could it be possible that we’re less likely to drive into the car that has stopped ahead of us if we need only wave a hand in the general direction of the radio to change the station, than if we have to reach out, find it, then turn it? Time will tell of course, but for now, it looks like most of the new stuff seen in such demo’s as Mercedes is showing off will be phased in slowly over time, as will other embedded technology that will forcefully prevent us from driving into one another, regardless of what’s on the dash, making such questions moot. "such as identifying builders as you pass them, or the stuff inside of them"...I'm hoping this is a typo...I would rather not know the name and internal contents of every roadside construction worker I drive past. I get in my car to get away from social media. Yes of course when I am in a car capable of well over 160 mph, all I can think about is sending a tweet to my friends as I fly down to road. Nothing like an $80K car to cruse for some social interaction in the gay area. Like in iRobot? no thanks.. whats wrong with trains, subways and busses? Trains, subways and buses take you from where you aren't to a place you don't want to go. You have to drive or walk to each of them. Oh gee what a PITA to walk 10 minutes. We won't walk 10 minutes, but we will spend 10 minutes driving to a gas station for the lowest price. Got some antisocial issues that need resolving, kochevnik? This needs to really be on the windshield to make it a true HUD. Having it still as a "dashboard" format defeats the whole purpose. That't nothing new. My hyundai does the same thing after heroin. Cool innovations! Although why is there still the same steering wheel. Innovative for a LA Fashionista not practical at all. How about a motion sensitive shifter or clutch control?